I'm getting more & more interested in vegetables with summer approaching and with the garden seedlings growing on the dining room table. I'm tired of winter veggies and simply steaming or roasting them. 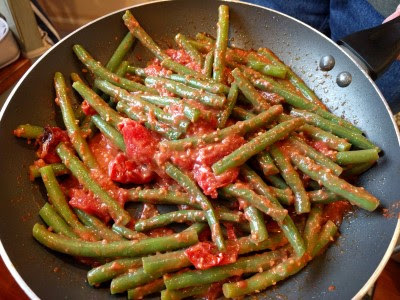 A couple weeks ago we decided to liven up our green beans and tried Blistered Green Beans with Tomato-Almond Pesto. The recipe was in the November 2015 Bon Appetit. We didn't really follow the recipe. It was more of an inspiration. I love tomatoes, especially roasted tomatoes, but I am not a fan of blistered (blackened?!) green beans. So we used more tomatoes than the recipe lists and we blanched & sauteed our green beans. We also substituted onion for garlic but sauteed the onion with the green beans instead of blending it into the sauce. The sauce is like a romesco sauce. We made a romesco sauce, long ago, and used hazelnuts. Either would work here. We had almonds on hand. We both really liked this dish. It took me a while to really enjoy the almond flavor since I don't really like nuts in my food. 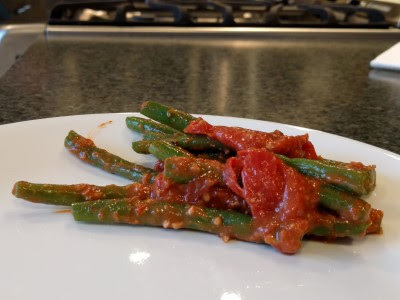 At first, we kept everything in separate containers, reheated the green beans, and spooned cold sauce & roasted tomatoes on top because that was the week my stomach was not happy and I didn't want too much sauce on my green beans. This dish is much tastier when all the ingredients are heated together, so after one night of cold sauce, we started re-heating our blanched green beans in a skillet, then spooned some sauce over, then added roasted tomatoes, and made sure everything was thoroughly warmed. I simply picked out the "less sauced" beans and tried to shake off excessive sauce! Preheat oven to 450°. In a bowl combine tomatoes with some olive oil then spread them out on a foil lined, rimmed baking sheet. Season with salt & pepper. Roast tomatoes, turning once, until blistered and lightly charred, 15–20 minutes. Let cool slightly. Finely chop almonds in a food processor. Add olive oil, vinegar, paprika, cayenne, and half of tomatoes. Pulse to a coarse pesto consistency. Season with salt and pepper. Heat some olive oil in a large skillet over medium-high. Add onion and green beans and saute until onion is soft and green beans are cooked to your liking. Season with salt & pepper. Add the pesto to the green beans and toss until combined. Add remaining tomatoes & serve.